Pink plumes. Grows up to 12 feet. Blooms in late summer. Hardiness zones 6-9. 200 seeds. The sturdy, fresh-green bloomstalks reach anywhere from 6 to 12 feet tall, capped by enormous "featherdusters" of brilliant rosy-pink. 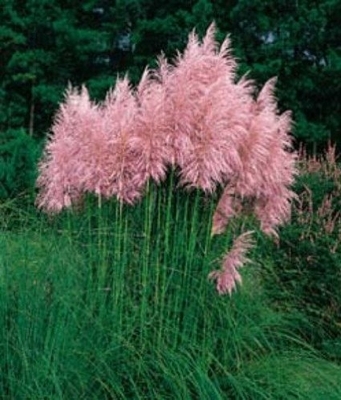 This ornamental grass blooms in late summer, just when the garden needs a little new color. Hardy in zones 6-9.